The community health fair for Soccer in the Streets was a great success, drawing hundreds of people from Huntington Park. “Vendors” at the health fair were volunteers from local clinics and health-oriented organizations that braved a few hours under the hot sun to give out educational materials about nutrition and related chronic diseases. Our own volunteers hosted a booth as well with a barrage of bilingual health education pamphlets for kids and adults with topics that ranged from diabetes to nutrition to cancer. 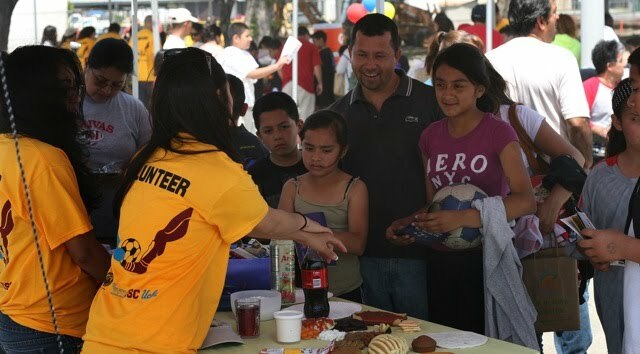 With the incentive of a free soccer ball, courtesy of the Los Angeles Fútbol Club, kids and their families approached the booths in the health fair to learn more about healthy meals, obesity, diabetes, and prevention of drug and alcohol abuse. Among the several services provided to the community were free oral hygiene lessons from USC dental students, BMI testing, blood glucose testing, and blood pressure testing from Western University pharmacy students, HIV rapid testing, and eye screenings from Bruins in Focus. As families moved through the health fair booth-by-booth to collect stickers for a free soccer ball, many stopped to ask questions, pick up pamphlets, or get a free screening from one of the several services available. It was fun to see the looks of enlightenment on kids’ faces as they learned about the merits of eating healthier (who knew hot Cheetos contains an ingredient that can also be found in deodorant?). Parents approached the local clinics’ booths with as much zeal as the children. By day’s end, most of the local booths had run out of educational material and all of the booths providing services ran out of testing supplies. Everyone who attended the health fair left with new knowledge of how to live a healthier lifestyle and received a free screening from at least one of the many services available. Catering to the Latino majority in Huntington Park, the entertainment at Soccer in the Streets was a varied array of the performing arts. From the swirling dresses of USC Ballet Folklórico to colorful traditional Bolivian dancers, Soccer in the Streets entertainment sampled a variety of Latin American culture. Huntington Park’s own Joe Nuñez sang a lulling ballad in Spanish, as well as popular American songs such as “I’m Yours” by Jason Mraz. Johnny Polanco and his band kept the crowd dancing with saucy salsa and the UCLA LASA’s Meregue Troupe showed off their moves for the audience. Families sat on the grass and enjoyed the festivities with their free healthy lunch or danced to the live music on the dance floor in the middle of the park.